Built in 1820 as an estate for a sea captain, this large traditional farmhouse was transformed in 1988 into a wonderful Bed & Breakfast Inn with 12 large bedrooms and a two bedroom suite, each with its own bathroom. 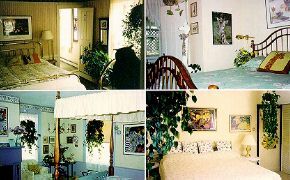 Each room has a different animal theme, plants abound everywhere, the atmosphere is relaxing. 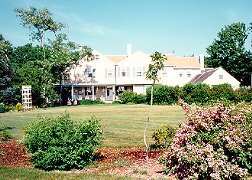 The Inn is the only one in Hyannis Port, and is less than a half mile from Hyannis, beaches, restaurants, shopping and island ferries. The best of all worlds in a country setting. We provide 10 speed bikes, beach stuff and reams of special information on what to do and see while day tripping the Cape and Islands. Full breakfasts are served each morning and wine and fun are served at sixish. 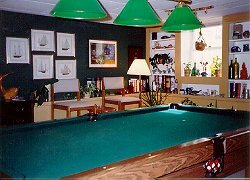 And for those that want more relaxation, we've added a regulation size billiard room, and an outdoor hot tub. Mid-week in winter, we hold single malt Scotch tastings there as well. Rooms have either twins, queens or kings and run from $200 to $260 in season and $120 to $160 in the winter and spring. We also have a 2 bedroom suite (1/queen and 1/two twins or a king) with a single private bath. In season $350 off season $200. What the heck, you're worth it! Kids, dogs, small farm animals and billard players are welcome. Drinking, smoking and carousing are permitted. We are rated well in bunches of guidebooks. We are rated even higher by guests. Call the Hyannis or Cape Cod Chambers of Commerce for their opinions. The Inn is simply wonderful ! The Cape is a great year-round vacation spot. Plan on spending several days to best enjoy your time. It takes a day or two to get around the Cape. Then take day trips from here to Nantucket and/or Martha's Vineyard. Then take a day to borrow a bike, peddle to the beach and explore the local delights. Every evening join us for wine & advice what great restaurant to enjoy that night. This is a wonderful place to be. Call Bill Putman, the Innkeeper of sorts, at 1-800-637-1649 or write here in cyberspace to simmonshomestead@aol.com. This and other Hyannis Port Bed and Breakfast Inns can be found here in The Register. 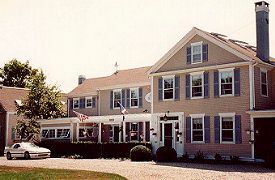 Romantic Country Inns, Getaways and B&Bs offer a great Cape Cod lodging alternative to big hotels.